Are you waiting until retirement to enjoy the life you want? It needn't be that far away. In this podcast episode, find out how you can start shaping and living the lifestyle of your dreams - now. Make that one day today. [Click To Tweet]. Decide where you’re going, then lay the tracks. [Click To Tweet]. Build your business around the lifestyle you want. [Click To Tweet]. James Schramko here, welcome back to SuperFastBusiness.com. Today, I’m going to talk about designing your life. It’s a weird topic, I know. But in this episode, we’re going to talk about how you can start to face reality, define your goals, let go of some traditional thinking, lay down some tracks, get your routine in place and the important thing you need to understand before this is possible for you. So I’m looking forward to helping you set your priorities, get set for this episode of SuperFastBusiness.com. Design your life. Strange concept. I first heard about it when I was about 18 or 19 years old. I went and saw a guy who was running a very successful business, and he was very young. He was apparently quite successful, and what he’s done is partition off his week by doing different activities on different days. He had his own business and some of the days were days off. And that really struck me as different because most people have a traditional job where they work 9 to 5, Monday to Friday. And of course these days with adults working more than they’ve ever worked before, quite often on the weekends and after work. With the accessibility of mobile phones, there really is no downtime. So are you toiling away at a job that you don’t absolutely love? Are you working too hard in a business that has yet to profit? Are you waiting for that one day when you can retire and start enjoying your life? Maybe that’s 50 years down the track. So many people are in the same boat. Not realizing that with some effort and commitment, one day can actually be a present reality. Here’s step 1 in designing your life: start with a mirror. Face up to the facts. No one is going to hand you the life you want on a platter. It’s just not going to happen. There are so many people cruising around with this entitlement issue. Any change that you want will have to come through you. There might be big challenges along the way, in fact, I’m almost certain there will be. You might even fail. You need to decide that it’s all worth it, that it’s important to you and that you’re ready to pay the price. And next time you walk past the lottery office and see people queued up hoping to win the $20 million payout, realize that that unfortunately is their strategy for success. They’re hoping that they’re going to win a lottery that has actually less likelihood of happening than them getting struck by lightning twice; not just once but twice. So it’s not much of a plan, is it? So start with a mirror. Look at that person who’s facing you in the mirror, and make an agreement that you’re going to get yourself where you need to be. The next step, step 2 in designing your life is define your goal. Seek to build a business that will sustain the lifestyle you want while being able to deliver genuine value to a lot of people. This really is the secret. You need to deliver value to a lot of people if you’d like financial success. But also, you’ll get a nice feeling knowing that you’re helping lots of people. So this is a really good one to do. A good rule of thumb, if you really want to change your life and for your effort to be worthwhile is to aim to earn at least 3 times what you would earn if you are working for someone else. So let’s put that in context. If you’re making $30,000 a year in a job, you’d want to make at least $100,000 profit in your own business. If you’re like me and you’re earning $300,000 a year in a job, then you’d want to make at least a million dollars a year for it to be worth changing. And that’s exactly what I did when I quit my job. To do this of course, you need step 3. Step 3 in designing your life is let go of traditional thinking. The majority of us are taught at every stage of education that the way to a satisfying life and financial security is getting and keeping a good job. Discard that mindset. Instead of creating value for one person, your employer, consider delivering value to many of your own customers. Instead of selling your time, buy other people’s time for your business. Instead of selling one-time services, sell recurring services. Only work on high-impact tasks rather than dispersing your efforts among many different projects. The problem with traditional thinking with the education system is simply this: your teacher probably went to school. And then after school, went to university to learn how to be a teacher, and then after that, they went back to school. In fact, there’s a pretty good chance that some of the people who taught you at school have never actually held a job outside of teaching. That doesn’t give them very good life experience. It certainly doesn’t help you become an entrepreneur. Now there are of course exceptions, and I’m sure there are some wonderful teachers. However, the system isn’t really designed for people to have independent thought. The system is really a throwback from the textile industry from when people needed to be occupied and told to do what they need to do so they could then go and sit on a machine, and sit there and follow instructions. So as soon as you start having independent thought, you’re letting go of traditional thinking. Step 4 in designing your life, lay the tracks. Just like a train, you need to decide where you want to be and what you have to do to get there. And then start making regular efforts that will propel you towards the desired result. Note: you’ve got to make sure that you’re happy when you get there. Some people spend time and energy working towards a goal that then they later realize they don’t want. I mean that’s insane. At the moment, the default position is that someone would work their entire career until they get to age 60-something, and then they can retire, and buy a caravan and drive around the country. That’s no way to live until you’re 60-something. And the fact is most people retire with not enough money to actually live off their own account, and they have to withdraw government pensions. The reality is with the ageing population, that money is just going to be there. So the sooner you can lay your tracks and figure out where you want to go, the easier it is for you to start focusing on what’s important, and that is putting in the regular effort to get to your destination. Step 5 in designing your life is to have a routine. Routine is important for keeping you grounded and moving in the direction you want. Instead of having to figure out constantly what to do next or having other people take over your schedule, decide what you can do regularly to move towards your goal and let it become a habit. If you’re still in a job, set aside a couple of hours each day to work on your business. In fact, I did an entire podcast on the transition between an employee to entrepreneur. Stick to your schedule; otherwise, your efforts may come to naught, like many things that people start. Routine and habit setting is what gets you through. Step 6 is acknowledging that you can’t do it all. As soon as you can, hire someone to help you. Outsource tasks that someone else could do better or that would save you time and money for another person to do instead of you. Some examples of this are customer support and content creation. These are fairly easy to get people to help you for. They’re fairly low salary output and a high impact to your business especially if you take my advice and take a recurring subscription business. I’ve got an episode on that. I’ve also got an episode on building your own team. Step 7, partition. Scheduling tools can allow you to partition off an entire week in advance, reserving periods for business and interactions with other people and leaving other blocks of time to do what you want, whether it’s a passion project or a simple recuperation exercise. Remember, lifestyle design is about building a business around the life you want to live. So put that in first and then build your business around that. In order to have lots of time for doing only the things you want to do, you need filters, and rules and structure. So get that partitioning happening. I like ScheduleOnce as a tool for this. Step 8 in designing your own life is your action step. This is the important part. You really need to get your priorities set now. So this is what I’d like you to do. Take a white board and on it, write everything you’re thinking of doing; everything. Just purge your mind. It might take you a few minutes. And when you’re finished, circle 3 things that are the most important and the most urgent for you to accomplish. Take a picture of the white board and put it in your Evernote, or on your camera upload or on your computer somewhere. And then wipe the board clean except for those 3 things. And just do those 3 things. When you’ve done that, rub them out, and do the exercise again. This also works with Post-it notes if you want to write an item per Post-it note. Stick them all over a wall, or a whiteboard or a window in order of importance and urgency. 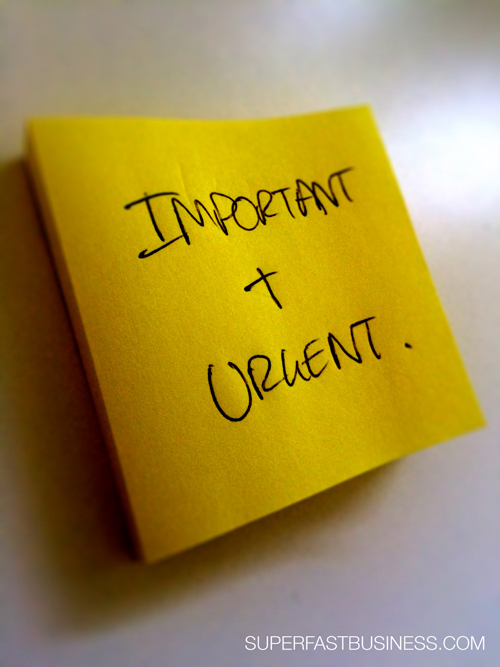 And then gather the notes in a stack from the least important or urgent at the bottom to the most important and most urgent on top. If you do that, then start from the top doing the most important and urgent thing. When you’ve done that, peel it off, and work on the next thing, and so on and so forth. I hope you’ve enjoyed this. If you really want some help with your business, I’d love to help you inside my membership community at SuperFastBusiness.com/membership. You can take a low monthly option, $79 per month at the moment, or a reduced price annual subscription. And inside there, you’ll find lots of training but also me and a whole bunch of other members who are happy to help you grow your business. And I’ll get you on track much faster than you trying to figure all of these out yourself. If you liked this podcast, please share it with a friend and be sure to give it a 5-star review on iTunes. Talk about it: What can you do today to be closer to the lifestyle you want? This is a great podcast as always. :) Thank you James ! I am wondering why people are not commenting to much on these podcasts if they are 27.000+ subscribers. Really ? Where are they ? 4) I don’t really have a comment based community (not as Bloggy as other sites). 5) I dont ask so many questions as just give answers. Lots of great advice as always! Thank You!